The Duette dual balloon, 100% silicone urinary catheter, is designed to maintain bladder mucosa integrity with its patented bladder protection balloon. Drainage eyes are located in between the retention and bladder protection balloon, designed for eliminating mucosa aspiration into the exposed drainage eyes and facilitating uninterrupted drainage. “When sufficient damage is caused to the bladder defense mechanism……….bacterial adherence to the mucosa or exposed mucosal cell receptors occurs, and the patient develops symptomatic cystitis” Curtis Nickel, MD FRCSC and J. William Costerton PhD. A second distal balloon, which is placed on the catheter tip, adds another layer in comprehensive infection control. It is designed to reduce incidents of CAUTI (catheter-associated urinary tract infection) by cushioning the tip to prevent trauma to the defensive bladder wall lining. The drainage eyes have been positioned between the two balloons, designed to prevent aspiration damage to the bladder’s defensive lining. The Duette™ is designed to be inserted and removed just like a standard Foley catheter. As a result, it requires little new training of medical personnel. Size should be bigger30 f. Size should be bigger30 f.
Active. Constantly Moving. 59 years old. Urge incontinence. Non irritating. Non irritating. Soft. Quality Made. All Sizes. Anyone who needs a foley.. Constant Protection. These are the best, the 2 balloons really protect your bladder. This product is well-made and well designed by a company that cares about those who use their products. The company designs products around people who have problems with the normal products that are on the market. You simply must try these Foley catheters they will change your life. They did mine. They don't get any more comfortable! Easy to insert. Comfortable to wear. Best ever. Work great. Daytime. Night time. At home. 59 years old. Urge incontinence. normal. I very promptly received my order today. I use the catheter in the correct way, and it inserted very easily. Once both balloons were inflated in the correct order I felt very confident. Connecting it to a new Belly Bag the functionality was perfect. Over the past few hours I hardly know it's there without the poking into the top of my bladder like regular catheters can do. Does this catheter have an open tip? 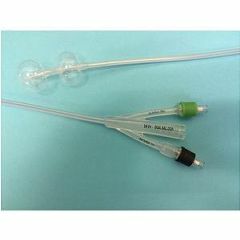 No, the tip is the same as other Foley catheters but the second balloon surrounds the tip preventing it from damaging the delicate protective bladder lining. If the bladder lining is damaged bacteria can easily colonize on the damaged tissue. 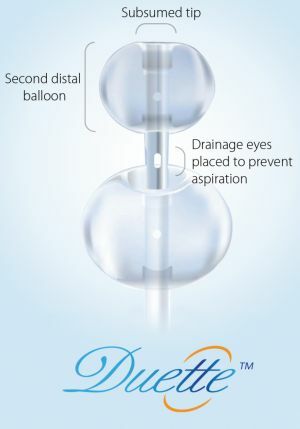 The drainage eyelets are located between the two balloons, which prevents the eyelets from coming in contacting the bladder lining and aspirating bladder lining tissue, which in turn exposes the layer of tissue beneath the bladder lining. No. The second balloon surrounds the tip to prevent the tip from damaging the bladder lining. The drainage eyelets are between the two balloons which prevents the eyelets from coming in contact with the bladder lining and aspirating tissue. Damage or irritation of the bladder lining gets infected easily. This catheter help prevent UTIs better than any I've used including the silver alloy coated catheters. No the tip is closed. Urine drains from the eyelets between the two balloons.